It isn’t the polar vortex that caused the TV Critics Association winter press tour to start nearly four weeks later than usual in Pasadena. To maneuver through the many events early through the year, it was decided to start a bit later said TCA president Dan Feinberg of the Hollywood Reporter, who himself had to come to the event late because of Sundance. The event that once began soon after Rose Bowl petals were swept is now scheduled through Super Bowl weekend and extending to nearly Valentine’s Day. If there were any hopes that more shows would be in production than there would have been just after New Year’s, or that more stars would be around since nobody had to worry about planning around the Golden Globes, those were dashed. So far, two broadcast networks have struggled with putting on even a half-day’s worth of panels at the Langham Huntington Hotel before handing off to their cable or streaming partners. The lack of evening parties meant no chance to catch up with stars over cocktails. Usually the post- Super Bowl slot has been a coveted one. Even capturing a fraction of the game’s ratings means a big boost for shows, despite the late start times that average from 10:20 to as late as 11 p.m. Recent years have seen an episode of “This is Us” that captured nearly 27 million viewers last year; the series premiere of the revived “24: Legacy” in 2017, and big season premieres for “Survivor: All-Stars” in 2004 and “The Voice” in 2012. It’s actually kind of rare to premiere a show after the Super Bowl, despite the big promotion that comes during the game. “Undercover Boss” did so in 2010 but to find a show before that you’d have to go back to “Family Guy” in 1999. 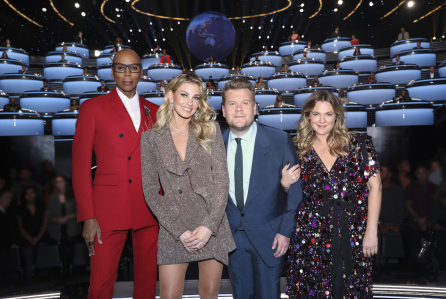 “The World’s Best” actually looks like a show we’ve seen before — or that we’re seeing right now with “America’s Got Talent: Champions,” a hastily taped internationally-themed talent variety show with celebrity judges meant to steal some thunder from CBS’ new show. It involves international acts like The Drowning Man, Monks of Steel, The Impossible Balancing Act and The Six Octave Man, all performing for the judges Drew Barrymore, Faith Hill and RuPaul, who was the only one of them who bothered to attend the press conference. “We were all not prepared for the emotional journey that the show and the performances took us on,” RuPaul said. The international judges, who range from ballerinas to MMA fighters, each have one vote to the American judges’ average of as much as 50 (so if “The World’s Best” is a United Nations kind of talent competition, then the U.S. judges constitute its Security Council). As on “America’s Got Talent,” there is a high tech edge to what essentially recalls the randomness of vaudeville, with a singer being followed by a gymnast, followed by a Houdini homage. An early favorite among the acts must be Hypno Dog, a mutt who drops a pile of volunteers on stage with his adorable stare. While the winner of “The World’s Best” will get $1 million, a bigger winner may be host James Corden, who not only introduces each, but often hams it up and gets involved with a lot of the acts. Darnell hopes the format catches on so it can be exported to other countries (just as “American Idol” and “Got Talent” was imported here). Once the late night post-Super Bowl premiere is over, close to midnight, the regular time slot for the ”The World’s Best” is Wednesdays at 8 p.m. on CBS, moving to 9 p.m. on Feb. 20.